While many in the media have speculated that the Kremlin had a hand in Wikileaks’ procurement of hacked Podesta emails – something Julian Assange denied last week – and US intelligence services officially accused Russian government-supported hackers of interfering with the US election (providing zero proof for the allegation), the truth is that Vladimir Putin is delighted with the outcome from the US elections: not so much for Hillary’s loss as that the sharp, neo-con wing in the Pentagon has been muted for the next four years. And, in the first test of Trump’s willingness to rebuild bridges with Russia, Putin’s spokesman suggested that President-elect Donald Trump should begin rebuilding the U.S.-Kremlin relationship by urging NATO to withdraw forces from the Russian border. Dmitry Peskov told the Associated Press that such a move “would lead to a kind of detente in Europe.” Trump repeatedly praised Putin during his campaign and suggested the U.S. abandon its commitment to the NATO alliance. 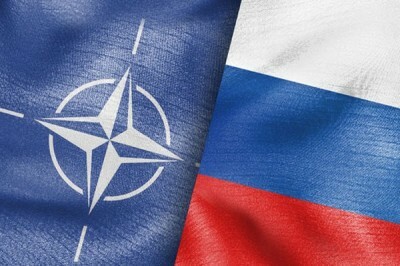 The request comes at a time of disturbing, relentless escalations in military tensions between NATO and Russia: this week we reported that NATO has placed as much as 300,000 troops on “high alert” in preparation for confrontation with Russia. Peskov said in the interview that the NATO presence does not make Russia feel “safe.” “Of course, we have to take measures to counter,” he said. When asked how Trump could approach the Crimea issue, quoted by The Hill, Peskov said it would take time. “We understand that it will take time for our partners in Europe, for our partners here in the United States to understand that. We are patient enough to wait until this understanding occurs here in Washington, in the States, in Europe,” he said. But while the Crimea issue is largely moot, with the West resigned to its concession to Moscow, fears that Trump will indeed follow Russia’s advice and pressure the alliance into standing down, or worse, withdraw US support, has resulted in outright panic, and according to German Spiegel, NATO strategists are planning for a scenario in which Trump orders US troops out of Europe. Of course, this is the same Spiegel which after Trump’s victory has predicted the end of the world. The NATO report likley also reflects current moods within the EU establishment as well, as Jean-Claude Juncker, President of the European Commission, has called on the member states to establish Europe’s own military. Washington “will not ensure the security of the Europeans in the long term… we have to do this ourselves,” he argued on Thursday. Because Greek troops just can’t wait to give their lives to defend German citizens and vice versa. Meanwhile, Spiegel admits that despite NATO’s bluster, Trump has all the leverage, and if Trump is serious about reducing the number of US troops stationed in Europe, large NATO countries like Germany have little to offer, Spiegel said. Even major member states’ militaries lack units able to replace the Americans, which in turn may trigger debate on strengthening NATO’s nuclear arm, a sensitive issue in most European countries for domestic reasons. How will Trump respond? It is unclear: while in his pre-election rhetoric, Trump pushed for an anti-interventionist agenda, and certainly made it seem that NATO would be weakned under his presidency, that remains to be seen as his transition team currently hammers out the specifics of his rather vague policies. We would not be surprised at all to find that for all the anti-establishment posturing, the “shadow government” – now in the hands of the Bush clan – which Ron Paul warned against earlier, manages to regain dominance, and far from a detente, Trump’s position emboldens NATO to pressure Putin even further. We would be delighted if our cynicism is proven wrong on this occasion.